This article is about the primarily continental European practice. For the defunct English practice, see Bull running. The running of the bulls (Spanish: encierro, from the verb encerrar, 'to corral, to enclose'; Occitan: abrivado, literally 'haste, momentum'; Catalan: correbous, 'street-bulls') is an event that involves running in front of a small group of cattle, typically six but sometimes ten or more, that have been let loose on a course of a sectioned-off subset of a town's streets, usually as part of a summertime festival. Particular breeds of cattle may be favored, such as the toro bravo in Spain, also often used in post-run bullfighting, and Camargue cattle in Occitan France, which are not fought. Actual bulls (non-castrated male cattle) are typically used in such events. The most famous bull-run – what a capitalized "the Running of the Bulls" most often refers to in English – is the encierro held in Pamplona during the nine-day festival of Sanfermines in honour of Saint Fermin. It has become a major global tourism event, today very different from the traditional, local festival. More traditional summer bull-runs are held in other places such as towns and villages across Spain and Portugal, in some cities in Mexico, and in the Occitan (Camargue) region of southern France. Bull-running was formerly also practiced in rural England, most famously at Stamford until 1837. The origin of this event comes from the need to transport the bulls from the fields outside the city, where they were bred, to the bullring, where they would be killed in the evening. During this "run", youngsters would jump among them to show off their bravado. In Pamplona and other places, the six bulls in the event are still those that will feature in the afternoon bullfight of the same day. 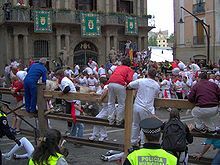 The Pamplona encierro is the most popular in Spain and has been broadcast live by RTVE, the public Spanish national television channel, for over 30 years. It is the highest profile event of the San Fermín festival, which is held every year from 6–14 July. The first bull running is on 7 July, followed by one on each of the following mornings of the festival, beginning every day at 8 am. Among the rules to take part in the event are that participants must be at least 18 years old, run in the same direction as the bulls, not incite the bulls, and not be under the influence of alcohol. In Pamplona, a set of wooden fences is erected to direct the bulls along the route and to block off side streets. A double wooden fence is used in those areas where there is enough space, while in other parts the buildings of the street act as barriers. The gaps in the barricades are wide enough for a human to slip through but narrow enough to block a bull. The fence is composed of approximately three thousand separate pieces of wood. Some parts of the fence remain in place for the duration of the fiesta, while others are placed and removed each morning. Spectators can only stand behind the second fence, whereas the space between the two fences is reserved for security and medical personnel and also to participants who need cover during the event. Police barrier at the beginning of the running stops people until the first rocket is fired. The encierro begins with runners singing a benediction. It is sung three times, each time being sung both in Spanish and Basque. The benediction is a prayer given at a statue of Saint Fermin, patron of the festival and the city, to ask the saint's protection and can be translated into English as "We ask Saint Fermin, as our Patron, to guide us through the encierro and give us his blessing". The singers finish by shouting "¡Viva San Fermín! and Gora San Fermin! ('Long live Saint Fermin', in Spanish and Basque, respectively). Most runners dress in the traditional clothing of the festival which consists of a white shirt and trousers with a red waistband (faja) and neckerchief (pañuelo). Also some of them hold the day's newspaper rolled to draw the bulls' attention from them if necessary. Pamplona, 2007. Bulls following some runners enter the bull ring from the callejón, where the event ends. The bulls can be seen in the foreground and background of the picture. A first rocket is set off at 8 a.m. to alert the runners that the corral gate is open. A second rocket signals that all six bulls have been released. The third and fourth rockets are signals that all of the herd has entered the bullring and its corral respectively, marking the end of the event. The average duration between the first rocket and the end of the encierro is two minutes, 30 seconds. The encierro is usually composed of the six bulls to be fought in the afternoon, six steers that run in herd with the bulls, and three more steers that follow the herd to encourage any reluctant bulls to continue along the route. The function of the steers, who run the route daily, is to guide the bulls to the bullring. The average speed of the herd is 24 km/h (15 mph). The length of the run is 875 meters (957 yards). It goes through four streets of the old part of the city (Santo Domingo, Ayuntamiento, Mercaderes and Estafeta) via the Town Hall Square and the short section "Telefónica" (named for the location of the old telephone office at end of Calle Estafeta) just before entering into the bullring through its callejón (tunnel). The fastest part of the route is up Santo Domingo and across the Town Hall Square, but the bulls often became separated at the entrance to Estafeta Street as they slowed down. One or more would slip going into the turn at Estafeta ("la curva"), resulting in the installation of anti-slip surfacing, and now most of the bulls negotiate the turn onto Estafeta and are often ahead of the steers. This has resulted in a quicker run. Runners are not permitted in the first 50 meters of the encierro, which is an uphill grade where the bulls are much faster. Two injured runners are treated by medical services. Every year, between 50 and 100 people are injured during the run. Not all of the injuries require taking the patients to the hospital: in 2013, 50 people were taken by ambulance to Pamplona's hospital, with this number nearly doubling that of 2012. Goring is much less common but potentially life threatening. In 2013, for example, six participants were gored along the festival, in 2012, only four runners were injured by the horns of the bulls with exactly the same number of gored people in 2011, nine in 2010 and 10 in 2009; with one of the latter killed. As most of the runners are male, only 5 women have been gored since 1974. Before that date, running was prohibited for women. Another major risk is runners falling and piling up (a "montón") at the entrance of the bullring, which acts as a funnel as it is much narrower than the previous street. In such cases injuries come both from asphyxia and contusions to those in the pile and from goring if the bulls crush into the pile. This kind of blocking of the entrance has occurred at least ten times in the history of the run, the last occurring in 2013 and the first dating back to 1878. A runner died of suffocation in one such pile up in 1977. Overall, since record-keeping began in 1910, 15 people have been killed in the bull running of Pamplona, most of them due to being gored. To minimize the impact of injuries every day 200 people collaborate in the medical attention. They are deployed in 16 sanitary posts (every 50 metres on average), each one with at least a physician and a nurse among their personnel. Most of these 200 people are volunteers, mainly from the Red Cross. In addition to the medical posts, there are around 20 ambulances. This organization makes it possible to have a gored person stabilized and taken to a hospital in less than 10 minutes. 1977 José Joaquín Esparza 17 Navarre, Spain Bullring Suffocated in a pile-up. The encierro of Pamplona has been depicted many times in literature, television or advertising, but became known worldwide partly because of the descriptions of Ernest Hemingway in books The Sun Also Rises and Death in the Afternoon. The cinema pioneer Louis Lumière filmed the run in 1899. The event is the basis for a chapter in James Michener's 1971 novel The Drifters. The run is depicted in the 1991 Billy Crystal film City Slickers, where the character "Mitch" (Crystal) is gored (non-fatally) from behind by a bull during a vacation with the other main characters. The run appears in the 2011 Bollywood movie Zindagi Na Milegi Dobara, directed by Zoya Akhtar, as the final dare in the bucket list of the three bachelors who have to overcome their ultimate fear; death. At first, the trio run part of the route. They stop at the square, but then recover their nerve, and continue to the end. The completion of the run depicts their freedom as they learn that surviving a mortal danger can bring joy. Running with Bulls, a 2012 documentary of the festival filmed by Construct Creatives and presented by Jason Farrel, depicts the pros and cons of the controversial tradition. Since 2014, the Esquire Channel has broadcast the running of the bulls as a show in the US, with both live commentary and then a recorded 'round up' later in the day by NBCSN commentators the Men in Blazers, including interviews with noted participants such as Madrid-born runner David Ubeda, former US Special Forces soldier turned filmmaker Dennis Clancey, the historic New York-born runner Joe Distler, and former British bullfighter and author Alexander Fiske-Harrison. Although the most famous running of the bulls is that of San Fermín, they are held in towns and villages across Spain, Portugal, and in some cities in southern France during the summer. Examples are the bull run of San Sebastián de los Reyes, near Madrid, at the end of August which is the most popular of Spain after Pamplona, the bull run of Cuéllar, considered as the oldest of Spain since there are documents of its existence dating back to 1215, the Highland Capeias of the Raia in Sabugal, Portugal, with horses leading the herd crossing old border passes out of Spain and using the medieval 'Forcåo', or the bull run of Navalcarnero held at night. Other encierros have also caused fatalities. Bous al carrer, correbou or correbous (meaning in Catalan, 'bulls in the street', 'street-bulls') is a typical festivity in many villages in the Valencian region, Terres de l'Ebre, Catalonia, and Fornalutx, Mallorca. Another similar tradition is soltes de vaques, where cows are used instead of bulls. Even though they can take place all along the year, they are most usual during local festivals (normally in August). Compared to encierros, animals are not directed to any bullring. These festivities are normally organized by the youngsters of the village, as a way for showing their courage and ability with the bull. Some sources consider this tradition a masculine initiation rite to adulthood. A bandido at Calvisson. Contact has been made with the bull: but it has not yet been stopped. The English town of Stamford, Lincolnshire was host to the Stamford bull run for almost 700 years until it was abandoned in 1837. According to local tradition, the custom dated from the time of King John when William de Warenne, 5th Earl of Surrey, saw two bulls fighting in the meadow beneath. Some butchers came to part the combatants and one of the bulls ran into the town, causing a great uproar. The earl, mounting his horse, rode after the animal, and enjoyed the sport so much, that he gave the meadow in which the fight began, to the butchers of Stamford, on condition that they should provide a bull, to be run in the town every 13 November, for ever after. As of 2013 the bull run had been revived as a ceremonial, festival-style community event. A variation is the nightly "fire bull" where balls of flammable material are placed on the horns. Currently the bull is often replaced by a runner carrying a frame on which fireworks are placed and dodgers, usually children, run to avoid the sparks. In 2008, Red Bull Racing driver David Coulthard and Scuderia Toro Rosso driver Sébastien Bourdais performed a version of a 'bull running' event in Pamplona, Spain, with the Formula One cars chasing 500 runners through the actual Pamplona route. The Big Easy Rollergirls roller derby team has performed an annual mock bull run in New Orleans, Louisiana since 2007. The team, dressed as bulls, skates after runners through the French Quarter. In 2012, there were 14,000 runners and over 400 "bulls" from all over the country, with huge before- and after-parties. In Ballyjamesduff, Ireland, an annual event called the Pig Run is held with small pigs. It looks just like a mini-encierro but with pigs instead of bulls. In Dewey Beach, Delaware, a bar named The Starboard[full citation needed] sponsors an annual Running of the Bull [sic], in which hundreds of red- and white-clad beachgoers are chased down the shore by a single "bull" (two people in a pantomime horse-style costume). In Rangiora, New Zealand, an annual Running of the Sheep is held, in which 1000–2000 sheep are released down the main street of the small farming town. The Running of the Bulls UK is a pub crawl event that takes place on London's Hampstead Heath and uses fast human runners in place of bulls. In 2014, Pamplona inaugurated a series of running events in June, the San Fermín Marathon, of a full marathon (42.195 km), half-marathon (21.097 km), or 10 km road race that concludes with the final 900m of each race using the encierro route, runners crossing the finish line inside the bullring. Many animal rights activists oppose the event. PETA activists created the Running of the Nudes, a demonstration done two days before the beginning of San Fermín in Pamplona. By marching naked, they protested the festival and the following bullfight, arguing the bulls are tortured for entertainment. The city of San Miguel de Allende, Mexico, cancelled its Sanmiguelada running of the bulls after 2006, citing public disorder associated with the event. After the event was cancelled in San Miguel, the city of Salvatierra, also in the state of Guanajuato, picked up the event. It is now called La Marquesada and the three-day event is held during the last weekend of the month of September or first weekend of October. Fiske-Harrison, Alexander, ed. (2016). Fiesta: How To Survive The Bulls Of Pamplona (3 ed.). Mephisto Press. ISBN 978-1986500272. Hillmann, Bill (2015). Mozos: A Decade Running with the Bulls of Spain. Chicago, Illinois: Curbside Splendor Publishing. ISBN 978-1-9404-3053-9. Some links may contain graphic content where marked. ^ a b c d e "Sanfermin guide: Running of the bulls". Kukuxumusu. 2007. Archived from the original on 5 May 2008. Retrieved 21 July 2008. ^ "Bull-run hits liquor-fueled town", 2 February 2009. "The tradition, enacted in a handful of Mexican towns, traces its roots back to the centuries-old Pamplona bull-run in Mexico's former colonial power." Retrieved 4 March 2009. 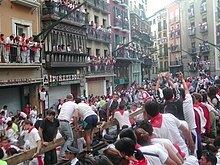 ^ "Running of the Bulls 2011 Live Stream, Pamplona San Fermin Festival Webcam Feed". PRLog. 5 July 2011. ^ "27 años de Sanfermines en TVE". RTVE.es. Corporación de Radio y Televisión Española. 2008. Retrieved 21 July 2008. ^ a b c d e f g h i j k "The Bull Run". Pamplona.net. Ayuntamiento de Pamplona (Council of Pamplona). 2008. Archived from the original on 29 May 2008. Retrieved 21 July 2008. ^ a b "Sección quinta". Bando San Fermin 2014. Ayuntamiento de Pamplona. Archived from the original on 2 April 2015. Retrieved 20 March 2015. ^ "Encierro bullrun San Fermin festival Sanfermines tourist information on Navarre". Government of Navarre. Retrieved 8 March 2010. ^ a b Alonso, Gorka (15 July 2013). "Los encierros se saldan con 50 heridos trasladados y 6 corneados". Noticias de Navarra (in Spanish). Archived from the original on 16 July 2013. Retrieved 15 July 2013. ^ "Los encierros de 2012 dejan cuatro heridos por asta, los mismos que en 2011". Diario de Noticias (in Spanish). 14 July 2012. Archived from the original on 19 July 2012. Retrieved 13 July 2013. ^ "Quinta mujer corneada en los encierros de San Fermín" (in Spanish). Diario de Navarra. EFE. 14 July 2013. Retrieved 15 July 2013. ^ Doria, Javier (13 July 2013). "Montón en el encierro de Sanfermines, un peligro con historia". El País (in Spanish). Retrieved 14 July 2013. ^ "Especialistas destacan que el dispositivo sanitario de los encierros "no se puede mejorar" porque es "espectacular"". Diario de Navarra (in Spanish). 18 June 2009. Archived from the original on 4 November 2013. Retrieved 16 July 2013. ^ a b c d e f g h i j k "La muerte de hoy es la número quince en la historia del encierro". Terra Noticias (in Spanish). Retrieved 6 July 2012. ^ "Muere el pamplonés Fermín Etxeberria, de 63 años, herido en el encierro del 8 de julio". DiarioDeNavarra.es (in Spanish). 25 September 2003. Archived from the original on 3 August 2009. Retrieved 10 July 2009. ^ "How to get the most out of your Pamplona Running of the Bulls experience". About.com. ^ Encierro de toros in the Spanish-language Auñamendi Encyclopedia. ^ Mari Carmen López del Burgo, aged 48, from Madrid, Spain. "Muere una mujer embestida por un toro en los encierros de Arganda del Rey". ElPais.com (in Spanish). 9 September 2010. Retrieved 9 September 2010. ^ Touristic leaflet. Festes de la Costa Blanca, Diputació Provincial d'Alacant, 2006, Alacant. ^ "Taurine traditions". OT-Sommieres.com. Office de Tourisme du Pays de Sommières. Retrieved 22 August 2017. ^ "Red Bull to visit Pamplona for Bull running". GPUpdate.net. 11 June 2008. Retrieved 30 January 2011. ^ Marszalek, Keith I. (24 June 2007). "Big Easy Rollergirls to reinact [sic] famed bull run". Blog.NOLA.com. Retrieved 2 July 2011. ^ "San Fermín in Nueva Orleans, The Running of the Roller Girls". Laughing Squid. 20 July 2008. Retrieved 2 July 2011. ^ Coviello, Will. "Running of the Bulls 2012". Gambit Weekly. Retrieved 18 July 2012. ^ "Dewey Beach, DE". The Starboard. Retrieved 2 July 2011. ^ "Home2018 - EDP San Fermín Marathon". SanFerminMarathon.com. ^ Running of the Nudes. PETA official site. Wikimedia Commons has media related to Running of the Bulls.